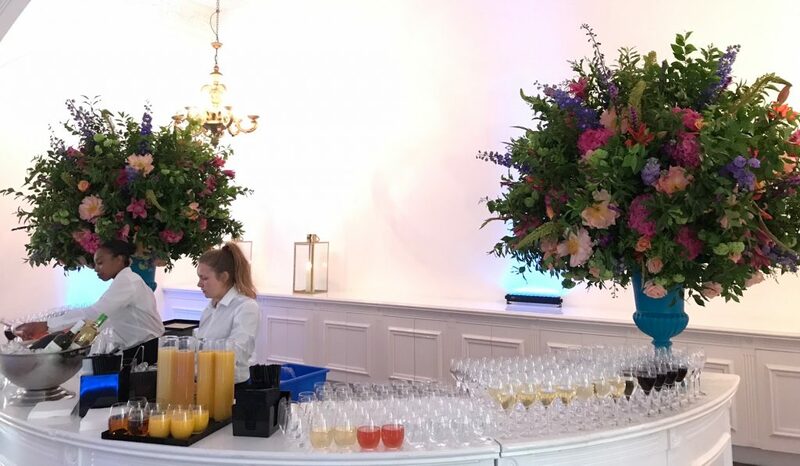 We always love creating events at One Marylebone. It’s impressive architecture and grand spaces create the perfect blank canvas for us to decorate. When we were commissioned to create the floral designs for a private celebration last week using a riot of bold and vibrant colours, we were thrilled. Custom-coloured turquoise urns (the guest of honour’s favourite colour) were filled to bursting with a joyful and bold combination of coral, pink, orange and purple tones. Bundles of luscious green British foliages were then combined to create large and vibrant pops of summer that filled the venue and made each and every guest smile! Low designs using the same selection of summer flowers were then placed on each dining table to create a luxurious and joyous setting for this private and very special celebration.